Tarrant County is getting nervous about losing the Texas Rangers. Make no mistake: Arlington and Tarrant County’s support for the Rangers is a matter of regional debate. Today, the Dallas Morning News also takes note of the attendance troubles with an article in the metro section. The Rangers are about to finish the season with their worst ticket sales since 2009, this despite the fact that TV ratings are up during the Rangers surge and Fox decided to broadcast Saturday’s Rangers-Astros game nationally. The attendance problems are likely to contribute to speculation that, perhaps, the time is ripe to push for a Rangers relocation to downtown Dallas. According to the Star-Telegram, Dallas city officials have denied that they are trying to woo the Rangers. However, the team has said they’d really love a stadium with a retractable roof. That sounds a bit like an invitation to suitors. We know how this story typically plays out. A team looks to relocate. Dallas gets all excited about finding a home for the team in the city center — maybe downtown, maybe in Fair Park. Then the surrounding communities that are not members of DART ante up with the economic development incentives they have at their disposal. The team flirts with a few cities. Dallas embroils itself in a contentious internal debate about the proper expenditure of city funds. And the teams get scared of crazy Dallas and end up moving to Arlington or Frisco for the cash. That’s exactly why right now is not the time for Dallas city officials to sit on their hands, but rather precisely the time to pounce. Here’s why. One of the unlikely heroes of this season’s resurgence is a revitalized Josh Hamilton. You remember Hamilton. He was a god during the Rangers’ late-2000s playoff deep runs and World Series appearances. Then he relapsed into drugs, had his personal life fall part, played poorly, got injured, and left town for the rival Angels. On the way out, Hamilton insulted Rangers fans. This wasn’t a “baseball town,” Hamilton famously quipped, cementing the arc of his descent from god to villain. But let’s revisit that nasty remark for a second. When Hamilton said we weren’t a baseball town, where exactly was he talking about? Dallas? Fort Worth? Arlington? When you think about it, Hamilton was right on one level. Because the stadium is located in Arlington, we are not a baseball town. At best, we’re a baseball region. There is a sound business rationale for locating sports stadiums in the center of the region. It has the potential of drawing from the widest breadth of the region’s population base. It can help boost audience and TV numbers because people from all over our sprawling metro area can identify an Arlington-based team as their team. But what we are seeing in Arlington this month is that a regional approach doesn’t help when it comes to attracting excitement and crowds to the ballpark during an unlikely — and therefore highly exhilarating and entertaining — late-season surge. The reason is same as why the idea of a “baseball town” exists in the first place. Imagine if the Rangers were playing in downtown Dallas while they were making their run for the playoffs. The 135,000 employees leaving their jobs at the end of the day would see a stadium lit up and ready for a game. The young people heading back to Uptown and thinking about which patio to hit for happy hour would see the stadium looming just a hop away. A dad rolling up to his house in Highland Park or North Dallas would suddenly remember that he and his teenage daughter are a few bucks on Stub Hub and a short DART ride away from watching a significant Rangers game in person instead of on TV. They’d likely be home before midnight. These are the kinds of people who fill up stadiums in other cities when the team isn’t playing well or playing unexpectedly well. The rationale for placing sports teams in Arlington follows a marketing model that treats sporting games as events. You plan it out. You buy tickets in advance. You make sure to bang off work early. You bring some extra money to buy merchandise to help mark the occasion. But the beauty of baseball is that with the extended pace and flow of its 162-game season, the experience can — and maybe should — be more casual and spontaneous. It should feel more like going to the movies than to a football game. In fact, with tickets for tonight’s game selling for as little as $10 right now on Stub Hub, it is cheaper to go to Rangers game than to go to the movies. But who would want to go to a movie in Arlington on a Tuesday night? 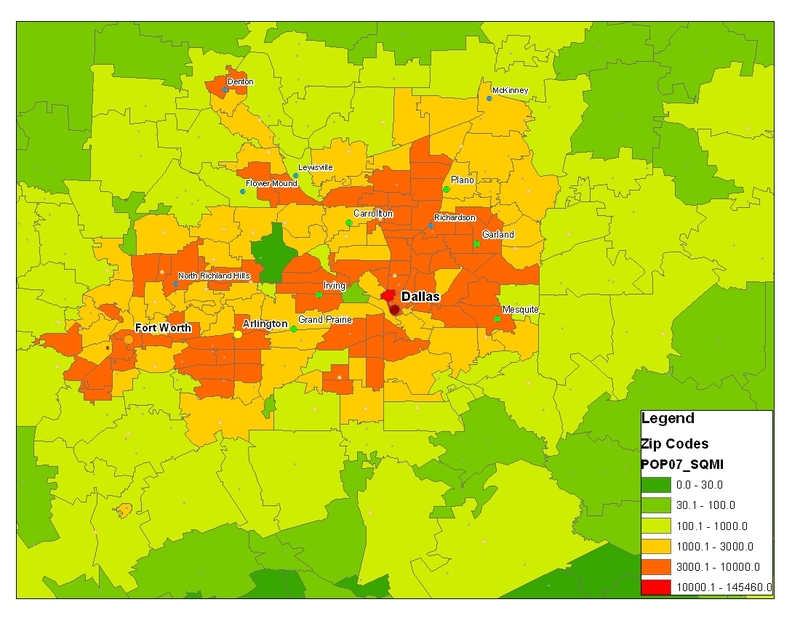 Even though the amazing growth of Tarrant County and the expansion of the region as a whole has moved the population center of DFW further west, the densest population of the region is still in the east. Density is important when it comes to attracting crowds to baseball games. It is not enough to be accessible to the most people. It is about being most conveniently accessible as large a segment of the population as possible. If the Rangers moved to Dallas, they wouldn’t lose TV audiences. After all, most of the state roots for the Rangers. But they would change the experience of going to Rangers game. It would be more spontaneous, casual, and elastic. The excitement of success on the field would more easily infuse into the community. Greater numbers of people would identify with the Rangers not just as the baseball team to root for, but as something that is important to the life, tenor, and culture of the city. That’s a value that is difficult to put a hard figure on, particularly when places like Arlington and Frisco are throwing hard cash on the table in the form of economic development incentives. Still, a downtown stadium does have a value, however difficult to quantify. In fact, it may be the most important value of all. It would do nothing less than make Dallas a great baseball town.